Before Monday's game, Triple-A Fresno catcher Tim Federowicz told Trent Thornton all he had to do was execute and they'd be just fine. What followed was perhaps the best execution of his career. 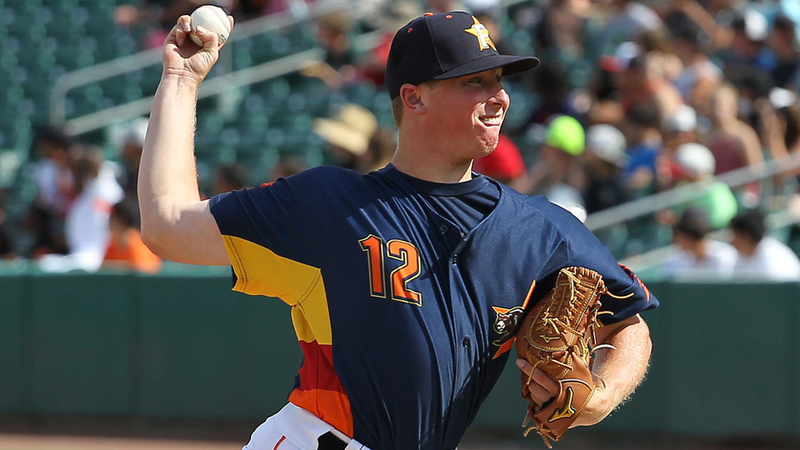 The Astros right-hander tied the Pacific Coast League record by striking out eight consecutive batters while matching his career high with nine total punchouts over six scoreless innings as the Grizzlies fell to the Aces, 3-2, at Greater Nevada Field. "It was pretty much like any other game, just mentally preparing for my start," Thornton said. "After the first batter, I struck out two guys and ended the inning and then struck out the side two innings in a row. In the back of your mind you're like, 'Wow that's eight in a row.' It was kind of neat." Ildemaro Vargas led off the bottom of the first inning with a single and was caught stealing by Federowicz. Then Thornton began his remarkable streak. For the next eight batters, the 24-year-old threw 23 of his 37 pitches for strikes, never getting into a three-ball count. Thornton hurled five first-pitch strikes as he remained in control of each at-bat. Throughout the run, Thornton kept hearing his total from teammates who were "chirping at him." A couple players who heard the broadcast in the clubhouse returned to the dugout to tell the righty he tied the record. Even his parents told him about the record with a postgame text. "Once I got to about six strikeouts, I was like, 'Oh jeez, that's kind of a lot,'" he said. "And then I added two more and it was eight. Then I faced Vargas in the fourth inning and he finally flew out to left field and I was like, 'Wow, I struck out eight in a row right there. "It would've been nice if we got a good team win because we played pretty well, but yes, it's pretty cool." Thornton joined Portland's Vean Gregg (1910), Phoenix's John Montefusco (1974) and Iowa's Ruben Quevedo (2000) as the only PCL pitchers to fan eight straight batters in a game. Thornton's streak came to an end with Vargas' flyout to lead off the third, but the University of North Carolina product kept his hitless stretch alive until Yasmany Tomas singled with two outs in the fifth. Tomas was thrown out at second on the play. With another strikeout in the sixth, the Pittsburgh native reached nine punchouts for the third time in his career and first since July 2016 with Class A Advanced Lancaster. Thornton lowered his ERA to 3.93 ERA while doubling his strikeout total to 17. The right-hander is 1-1 with six walks over 18 1/3 innings in four starts for Fresno. "If I can go out there and locate my pitches the way I'm capable of, hopefully I can have more outings like [Monday]," he said. Federowicz put Thornton in line for the win with a two-run homer in the sixth, but Reno rallied two frames later. Remaining at the center of the action, Vargas knocked an RBI single and Cesar Puello slapped a go-ahead two-run double for Reno. Aces reliever Jake Barrett (1-0) worked around a walk with two strikeouts in a hitless eighth for the win.